How To Return Or Exchange Faulty Items? We comply with EU rules, under which you always have the right to a minimum two-year guarantee period. In some cases an extended guarantee period applies when stated on our website www.sportisimo.com, in the product description or in the manufacturer’s warranty. The guarantee period starts from the day you receive the goods. In the case where a claim is resolved by providing a replacement a new guarantee period of 24 months begins. How To Claim a Refund Or Exchange? 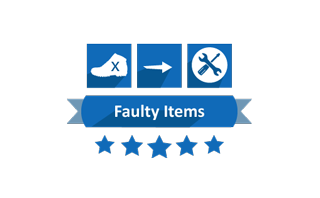 If you believe your item is faulty, please return it to us with an enclosed invoice (make sure to save a copy for yourself) and a filled out Claim Form. Please make sure to pack the goods accordingly so that they aren’t damaged en route to us. We also recommend that you obtain a proof of postage receipt. Enclose the invoice (make sure to save a copy for yourself) and a filled out Faulty Item Form.